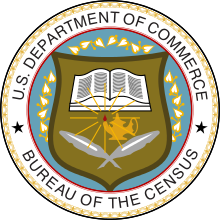 The United States Census of 1820 was the fourth Census conducted in the United States. It was conducted on August 7, 1820. The 1820 Census included six new states: Louisiana, Indiana, Mississippi, Illinois, Alabama and Maine. There has been a district wide loss of 1820 Census records for Arkansas Territory, Missouri Territory and New Jersey, however. The total population was determined to be 9,638,453, of which 1,538,022 were slaves. The center of population was about 120 miles (193 km) west-northwest of Washington in Hardy County, Virginia (now in West Virginia). This was the first census in which a state recorded a population of over one million – New York and Pennsylvania – as well as the first in which a city recorded a population of over 100,000 – New York. It was also the first census in which Baltimore was ranked as the country's second-most populous city. Several of these columns were for special counts, and not to be included in the aggregate total. Doing so would have resulted in counting some individuals twice. Census takers were asked to use double lines, red ink or some other method of distinguishing these columns so that double counting would not occur. For example, the count of free white males between 16 and 18 was a special count, because these individuals were also supposed to be tabulated in the column for free white males of age 16 and under 26. The other special counts were foreigners not naturalized, persons engaged in agriculture, persons engaged in commerce, and persons engaged in manufacture. Census takers were also instructed to count each individual in only one of the occupational columns. For example, if an individual was engaged in agriculture, commerce, and manufacture, the census taker had to judge which one the individual was primarily engaged in. Censustaking was not yet an exact science. Before 1830, enumerators lacked pre-printed forms, and drew up their own, sometimes resulting in pages without headings, line tallies, or column totals. As a result, census records for many towns before 1830 are idiosyncratic. This is not to suggest that they are less reliable than subsequent censuses, but that they may require more work on the part of the researcher. ^ Between 1790 and 1860, the state of West Virginia was part of Virginia; the data for each states reflect the present-day boundaries. ^ The District of Columbia is not a state but was created with the passage of the Residence Act of 1790. The territory that formed that federal capital was originally donated by both Maryland and Virginia; however, the Virginia portion was returned by Congress in 1846.